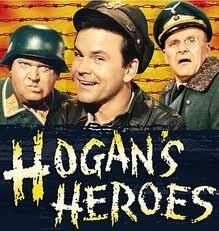 If you've never watched an episode of Hogan's Heroes, you might not believe me; but it really is a well-written, witty, entertaining show. I actually loved watching it as a girl (I know, I know, we just didn't have a lot to choose from on TV back then) for the comedy and the intrigue and, of course, my serious crush on Colonel Hogan. The show is still broadcast in syndication on various television stations and my 12 year old son has been hooked on it for over a year now. Most boys his age are enamored with war (hence the popularity of video games as Modern Warfare , Call of Duty , and Battlefield Modern Combat ) so he really enjoys the World War II setting of the show. He's actually learned a bit from it - now familiar with the Luftwaffe, Allied forces, the Russian front, the Geneva Convention, Mein Kampf, Stalin, the BBC, and Stalingrad, he actually takes an interest in the war memorials and plaques found ubiquitously throughout Europe. Typical World War II memorial plaque. Anyway, the most impressive aspect of the show is its production value and the performances of the actors. Werner Klemperer (Colonel Klink) received six Emmy nominations for supporting actor on Hogan's Heroes, winning twice. Richard Dawson (who plays Cpl. Newkirk) is adorably funny with his charming Cockney accent (it helps if you can forget his later creepy tenure as the kissing host of Family Feud). The international crew of prisoners running their elaborate American intelligence operations provide great comedy with just enough absurdity to truly make Hogan's Heroes fun to watch.